These games for elementary students are a fun way for young readers and writers to practice phonics, basic grammar, spelling and sentence structure. 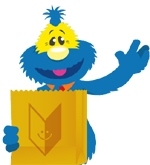 The games are from a variety of educational websites, including Funbrain, a site supported by the Family Education Network, the Scholastic website, the BBC school page, as well as ZiggityZoom and Reading is Fundamental. If you have similar games to share, add them in the "comments" section on the bottom of this page. For children learning the alphabet, this game allows for practice of letter recognition. Choose a character and listen to hear the name of the letter. Find the letter and blast it. Help clean up the beach by choosing the correct part of speech recycle bin for the words. This game can also be played in Spanish. The Grammar Gorillas need help identifying parts of speech. Click on the correct word in the sentence, and they will get a banana. Help 2Bee collect more flowers by choosing the correct form of the copular 'be' verb in each sentence. These interactive reading games are ideal for developing reading skills of young students. Help Zara's dream come true by clicking on the sentence that makes sense. Help Max and Molly talk to the aliens by correcting the sentences with punctuation and capital letters. This game is on the CBBC website, which has several other reading and spelling games. Can you shop and drop? The goal of this game is to find the items on the shopping list and drag-and-drop the picture of each item to the shopping cart before the clock runs out. This game is also available in Spanish. Words are buried underground. Choose the correct words that rhymes and help Digby's shovel reach the word. Practice spelling familiar words by choosing the letters on the letter wheel. A contraction is in the air, but what does it mean? Click on the correct meaning of the contraction from the choices that fly by! Build a clubhouse by choosing the correct sentence category and correcting the sentence capitalization and punctuation.